Our first weekend of A Midsummer Night's Dream went over well, according to the Seattle Times and The Gathering Note. Over the next couple of days I'm going to be chatting with some of the performers about their experience with the show: today, tenor Alex Mansoori, who plays Francis Flute the Bellows-Mender and, as Flute, Thisbe. JD: Alex, Seattle Opera has been proud of your work this year as a Young Artist, as Lensky in Tatyana's Letter, Loge/Mime in Siegfried and the Ring of Fire, and now your show-stealing performance as Flute/Thisbe. ("I kiss the wall's hole!" seems to slay them every night.) But this is not your first engagement with Seattle Opera: tell us about your ancient history with us. AM: My time with Seattle Opera starts out when I was 11 in the children's chorus of Carmen. I sang "The Star Spangled Banner" for my audition. After that, I was in Turandot and was one of the six children in Werther. It's nice to be back in familiar stomping grounds. JD: Most performers might consider Shakespeare's words and Britten's music a daunting challenge. What's the trickiest thing about performing in Midsummer? AM: The hardest part is singing Britten's difficult music while running around the stage. On top of that, the Rustics also have to be in tune with each other and the Maestro to stay together. It takes a tremendous amount of focus. JD: You're obviously a gifted comedian. 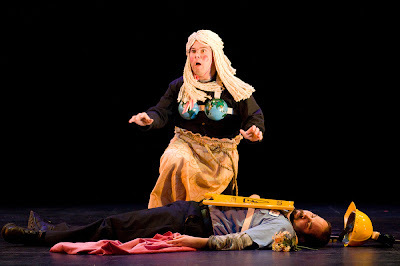 But is there anything more to Flute/Thisbe than sheer silliness? AM: Well, I think whenever I'm doing a comic role, the challenge (and what is funniest) is making the character real, and not campy. The audience can tell the difference between a realistic reaction in a comedic role and an actor asking for a laugh. That's a fine line, and it gets even smaller when you're a man playing a woman. JD: What's your favorite part of the opera? AM: There are so many! I love the play, especially since the audience has seen it building the entire show. I also really love the children's chorus at the end of Act II because the music is elegant and beautiful. AM: I head to San Francisco for the summer, as a member of the Merola Opera Program. Then I'm back in Seattle for a second year with the YAP. And check out www.alexmansoori.com!